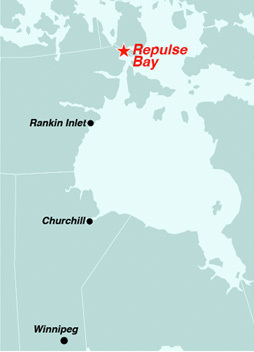 Repulse Bay lies directly on top of the Arctic Circle in central Nunavut. 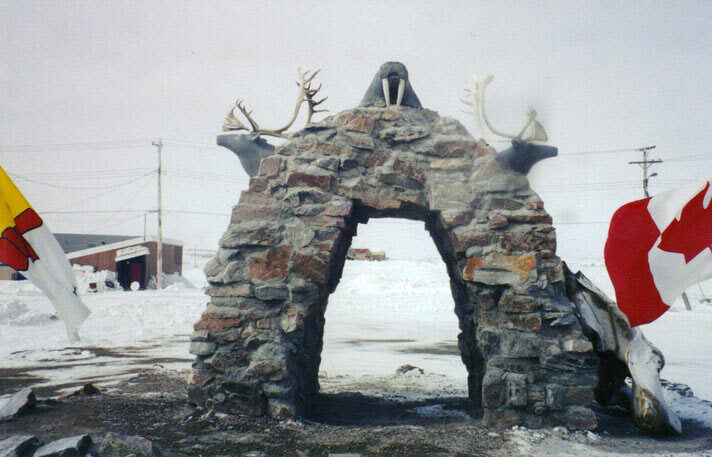 It is here that the Arctic Circle cairn stands, a symbol that marks the Arctic Circle's location. Repulse Bay is the only North American community located on the Arctic Circle. The Arctic Circle is a line that delineates the points on the earth's surface north of which the sun is above the horizon for 24 hours on June 21, and entirely below the horizon for 24 hours on December 21. The Inuktitut name for Repulse Bay is Naujaat, which means "nesting place for seagulls". Nesting grounds are located on cliffs five kilometers north of the community and every June the area is occupied by thousands of seagulls, as well as snow birds, loons, eider ducks, longtail ducks, and jaegers. 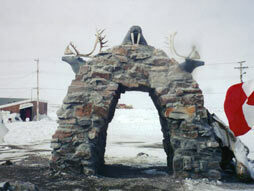 Repulse Bay is renowned for its excellent artisans, especially for its Inuit carvers who work in bone, ivory and stone. The past is valued here, as you'll soon see. Artisans create exquisite imagery in stone, intricate jewellery, and beautifully designed clothing that is warm and practical. The children of Repulse Bay are among the friendliest in the Arctic. They'll greet you with shy smiles that turn into a friendly "Hi!" Then, they'll ask your name, tell you theirs, and an instant friendship blooms. Getting There: Calm Air and First Air operate flights from Winnipeg and Rankin Inlet. Check schedules for more information.